Joining the Snowbirds will be the all-new US Air Force F-35A Lightening II Demo Team, the USAF A-10C Thunderbolt II Demo Team and the US Navy F-18 Super Hornet Tailhook Legacy Demo Team to highlight the 2019 Airshow taking place Oct. 4 – 6 in Huntington Beach. 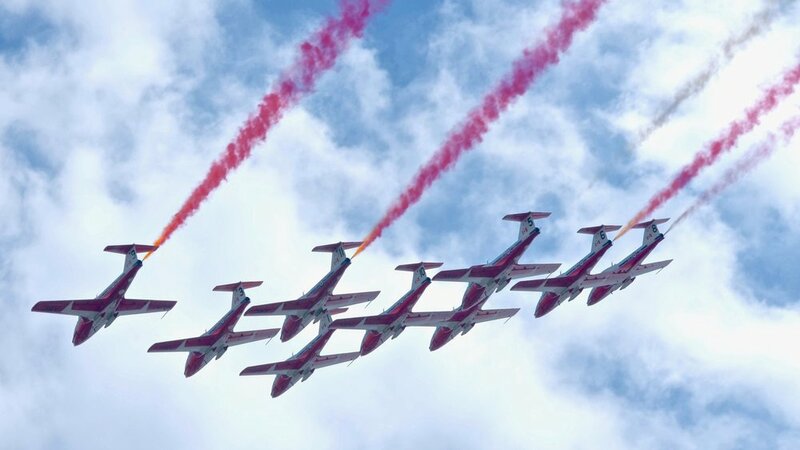 (Huntington Beach, CA) Jan. 24, 2019 – The stylish and skillful nine-jet Canadian Forces Snowbirds team will return to Huntington Beach to headline the fourth annual Great Pacific Airshow, which will take place Oct. 4 - 6, 2019. Officially known as the Canadian Forces 431 Air Demonstration Squadron, the Snowbirds will be joined by the US Air Force F-35A Lightning II Demonstration Team in their premier airshow season, plus the USAF A-10C Thunderbolt II Demo Team and the US Navy F-18 Super Hornet Tailhook Legacy Demo Team as the featured military performers for the 2019 Airshow. The 2018 Airshow attracted more than two million attendees, making it one of the largest airshows in the United States, and was recently named by the U.S. Air Force Thunderbirds the 2018 Civilian Show Site of the Year! “Each year The Great Pacific Airshow grows in reputation and quality of experience for attendees and performers alike. We are honored to have the Canadian Forces Snowbirds back in Huntington Beach to thrill the crowd with their graceful precision,” said Kevin Elliott, airshow director and CEO of Pacific Airshow LLC, operator of The Great Pacific Airshow. F-35 pilot, Capt. Andrew “Dojo” Olson, will demonstrate the mind-blowing capabilities of the agile Lightning II/Joint Strike Fighter during this all new solo aerobatic display to be followed by the A-10 Thunderbolt II’s demonstration of its legendary close-in air support capabilities. The F-35 and A-10 will then join in a stunning formation with historic Air Force warbirds for the US Air Force “Heritage Flight”; a stirring tribute to the sacrifice of those currently serving, as well as the sacrifices of war heroes of the past. The US Navy’s Super Hornet Tailhook Legacy Demo Team from VFA-122 at NAS Lemoore will showcase the performance of their F/A-18 Super Hornet and will perform a moving tribute of their own by joining in formation with historic Navy aircraft.